Ann Young was the 36-year-old wife of George Young and the mother of Seth, the first son born to white settlers in Dodge County. The year was 1856, and after forsaking plans to homestead in Kansas the tiny colony, consisting of the Youngs and her brother's family, the Robert Millars, settled down for the night of July 4th near the location which later became North Bend. During the remaining summer and fall they built log dwellings and prepared for a difficult winter. It was one of the bitterest on record. These were the conditions into which baby Seth was born in November. Less than a month later he was motherless. Ann didn't recover her strength and died at Christmastide. A coffin was fashioned from kitchen floorboards, and she was buried New Year's Day on the knoll which became this cemetery. Many of the later burials were moved to the Woodland Cemetery, established at North Bend in 1887, but Ann and a large number of others remain. Seth saw that the burial ground was cared for until his death in 1952. The burial ground is the oldest in Dodge County and represents an important chapter in Platte Valley history. It reminds us, through the presence of Ann Young, of the extreme hardships faced by our early pioneers, particularly by pioneer women. 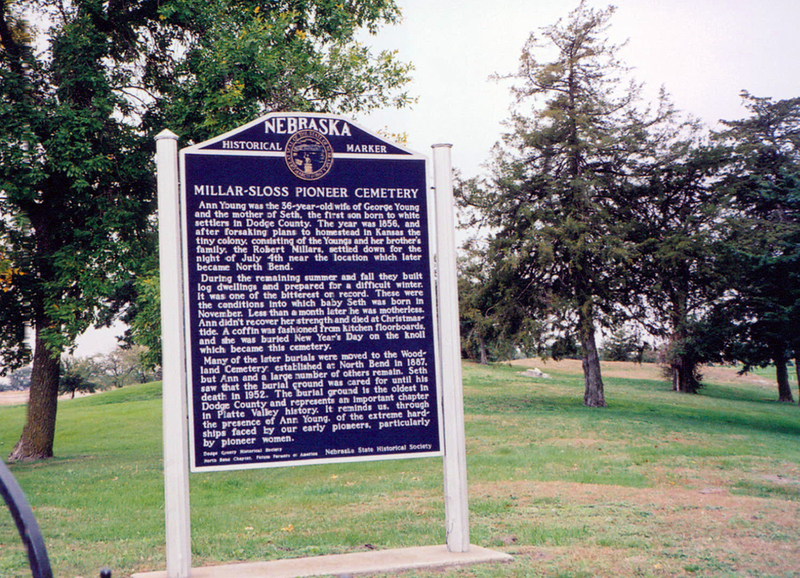 “Millar-Sloss Pioneer Cemetery,” Explore Nebraska History, accessed April 18, 2019, https://mynehistory.com/items/show/161.